Don’t Hide the Veggies from Your Kids! Being a new mom and having so many friends that are moms, the subject of getting your kids to eat their veggies comes up a lot. I haven’t had to experience it yet as my little one is still breastfeeding, but I’m noticing that it’s a common challenge. 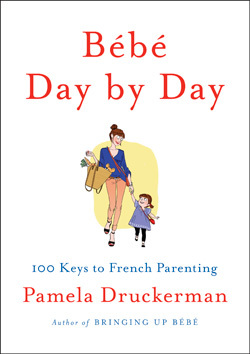 This summer I read “Bebe Day by Day: 100 Keys to French Parenting” by Pamela Druckerman. It’s a guide-book based on her non-fiction book “Bringing up Bebe,” the story of Druckerman’s experience raising her daughter in Paris. While living in Paris, she notices a marked difference in French vs. American parenting styles. Her motivation to write the book stems from an experience in a Parisian restaurant. Her daughter is screaming, throwing food while the French children are sitting quietly eating lunch with their parents. There are so many great tips in this book, but the section on food interested me the most. One major difference that Druckerman noticed between French and American kids is that they eat their vegetables with very little resistance. In fact, they start every meal with a vegetable course. There’s no song and dance involved, or coming up with multiple ways to hide vegetables amongst tons of cheese. The French children know they’re eating vegetables and they’re fine with it. How is this possible? French kids don’t get chicken nuggets and French fries on a regular basis. They eat what their parents eat, ie. vegetables, fish, chicken, cheese, eggs or soup. French parents aren’t chasing after their children with containers full of cheerios or Goldfish. Kids get one afternoon snack, called a gouter. It’s common sense really – if kids don’t snack as much, they’re more likely to be hungry at dinner and eat what’s being served, like vegetables. I would suggest the same rule for adults. In France, kids don’t have the right to open the fridge and grab whatever they want, whenever they want. Again, this cuts down on snacking and ensures they’re hungry for dinner. When kids get involved in the cooking process, they are more invested in what they’re eating. Perhaps if you let your 5-year-old make the vinaigrette, she will be more interested in eating the salad. Other tasks like peeling vegetables, mixing muffin batter, tearing up spinach or peeling eggs are all kid-friendly kitchen tasks. A bowl of peas in a pod, some cut-up cherry tomatoes with olive oil and salt or sauteed broccoli. Your child is hungry because they haven’t been snacking all day. Put the veggies on their plate, and wait. There are no choices or customizations. When your child tries something new, or eats a vegetable, don’t freak out and start cheering. Produce a neutral reaction, and instead ask them questions about how it tastes. My parents always said this to my sisters and I growing up: just try it. We did, and most of the time I liked it, and now I’ll eat anything. Even if broccoli isn’t a hit, keep re-introducing it. It may not be her favourite, but she will come to regard it as normal. Leftover food can be saved for a snack or lunch the next day. I think one of the major causes of weight gain in our society is the notion that we have to finish all the food on our plates regardless of if we’re full or not. We were never taught to listen to our inner hunger cues. It’s important to teach your child to be an independent eater and regulate her own appetite. Start with a small portion, and let them tell you if they want more or if they’re done.